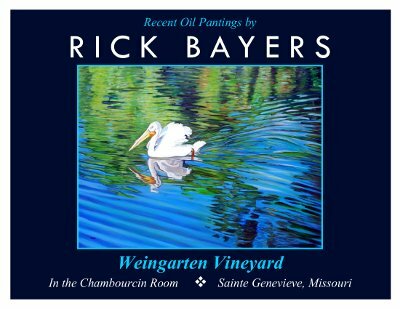 We are honored and excited to showcase the oil paintings of local artist Rick Bayers in our Chambourcin Room. From Festus Missouri, Rick specializes in American landscapes and portraiture. His work includes the simple and serene landscapes of the Midwest, rich and breathtaking scenes from the Southwest, and the picturesque vistas of California’s West Coast and Wine Country. Rick is also a master of portraits. His subjects include corporate CEOs and officers, as well as portraits of children and families. Rick’s work was shown at the 2011 Kodner St. Louis River Keepers Exhibit and at the “Best of Missouri Painters” at the Missouri Botanical Gardens. The artwork exhibited in the Chambourcin Room will be available for sale.